12 facts that show why I'm glad that Bernie took the deal. And it's perfectly okay, a great option, and does way more good for the world than any sort of incarceration or punishment would. 1. The money is being paid to the German government, not to a single individual as a form of bribe. This money will be used to provide services to German citizens. $1m is going to a children's hospital. 2. If Bernie went to jail, he'd go to the jail they send financial criminals. This is not a very large punishment, and he would likely maintain control over F1 either directly or through proxies. Likewise, his quality of life would likely not suffer very much. 3. If Bernie went to jail, the max sentence is 10 years for bribery. He would likely die before the sentence was carried out, putting him at 93 years old upon release. 4. Bernie paid $44m to the broker to make the deal go through as he intended. More on that below. 5. Bernie claimed he was blackmailed by the banker. The banker claimed Bernie was threatening him to make the sale go as intended. Officially, Bernie was being paid a commission to help with the sale. Unofficially, who knows? Both sides deny wrongdoing and testify that the other was in the wrong. 6. The shares that Bernie had prior to the sale were owned by Investment Banks, and were liquidated later. This means the F1, prior to 2005, was largely being owned (with a controlling stake) by creditors. Bernie had a 25% ownership stake, and often clashed with the other controllers on how the company should proceed. In particular, BayernLP, a german bank, controlled most of F1 at the time. It is the state bank of Bavaria. 7. In 2005, He sold controlling shares in F1, and used the profit to buy shares in a new controlling company, CVC, for an undetermined amount of total shares. By early 2006, this company had 86% ownership. Lehman Bros. owned the other 14%. (Uh oh, guess where this is going?) and by March, CVC owned 100% of the company. The bribe occured during the 48% controlling stake sale to CVC. 8. During all that mess, Bernie had purchased that large stake in CVC for about 860m euros, and afterwards, CVC wanted to buy that 48% control stake. It is implied that Bernie wanted the sale to go to CVC, and bribed the risk analyst to make them appear more appealing. This is because he would then subsequently buy a larger stake in CVC using the profits, without competing. 9. Further complicating things, the banker ensured that Bernie would recieve a 41m commission for the sale. 10. What would prevent this from happening is the risk analyst determining a fair price for the transaction, and comparing the other buyers. This is the banker who accepted the bribe. The idea is that he made Bernie, as a controller, and CVC as a company, seem like a much better financial proposition, by making him to be a far less risky investor than others who were willing to pay more. 11. So, in other words, the victims of this crime are companies, other than CVC, who wanted to purchase the stock, who lost some potential money and control on CVC's way to 100% F1 ownership. Essentially, Bernie found a clever (but illegal) way to convert his riches into more control over F1 at a lower price than the other guy. 12. The banker who took the bribe, Gerhard Gribowsky, was sentenced to 8.5 years in jail. 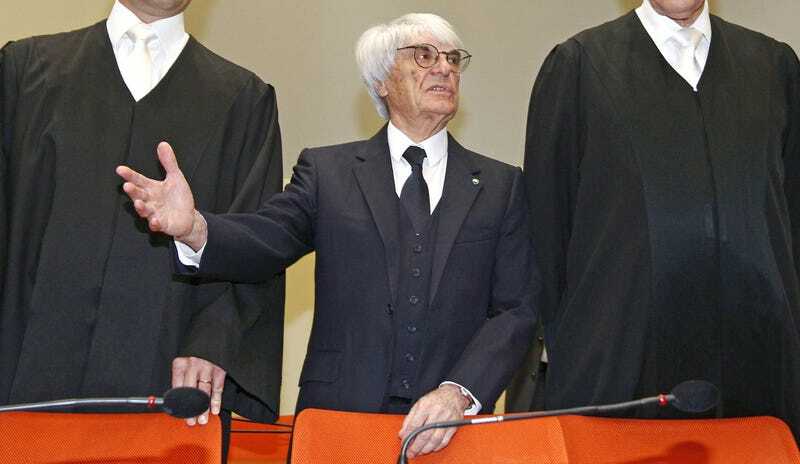 Unlike Bernie, he does not control a stake in F1, is not likely to die any time soon, and could potentially accept more bribes in the future if he is allowed to pay the court to avoid jail time because of this. It's likely that part of the CVC sale was that Bernie would maintain executive control over F1. If the sale had not gone to CVC, the new owners could legally fire Bernie and replace him with whomever they chose, a likely scenario. Ultimately, Bernie likely made the bribe not to make money, but to maintain control over the company he'd ran for 30+ years. This is another reason why the court would be likely to give him a deal rather than jail him. While you can argue that he shouldn't have been allowed to maintain control over F1 because you don't like the way it has gone, without knowing the other candidates for the sale it would be hard to say that. It's not like we've had very many examples of different people running it. So, at the end of the day, the German courts are making a smart move by offering him this deal, and he's making a smart move by taking it. It benefits everyone a whole lot more than if he had paid for it. If you're still unhappy about missing a chance to get Bernie out of F1, rejoice in that incarceration wouldn't have resulted in his loss of control, and that he would only be out of F1 if he had sold out back in 2005, so we're long past that point. So for now, you'll just have to wait for him to die, or for someone else to buy up his stake.